Sehen Sie die Strände der Normandie, in denen wichtige D-Day-Aktivitäten stattfanden - und zollen Sie jenen Tribut, die während der Kämpfe ihr Leben ließen - auf dieser privaten, ganztägigen Tour von Paris aus. Ihr Tag beginnt früh am Morgen mit Abholung direkt von Ihrer Unterkunft; Ihr Reiseleiter wird Sie mit Kaffee und Croissants begrüßen. 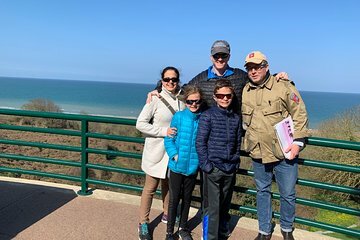 Fahren Sie mit dem klimatisierten Minivan in die Normandie, wo Sie den Omaha Beach, den American Cemetery in Colleville-sur-Mer, die Pointe du Hoc und andere wichtige Sehenswürdigkeiten sehen. If you want a wonderful once in a lifetime experience, book this tour through Viator and ask for Igor. He was simply fantastic. He picked us up from Paris and drove the 3 1/2 hour trip to Normandy. The car was clean and comfortable and equipped with water, pillows, blankets and a DVD player to watch era-related movies. Igor was knowledgeable and learned very quickly our particular interests so he could highlight the events and places to what we wanted. He went above and beyond and we so appreciated his making this a excursion one for the ages. We travel a lot and Viator will be the first place we look for tours. This was the highlight of our time in England and France. Igor, our tour guide, was a storehouse of knowledge about WW II. We only had time for the one-day tour. Igor picked us up at our hotel and managed to fit in a comprehensive tour in one day. We ended the day at the Normandy cemetery. I hope we can return one day and that Igor can once again show us even more.